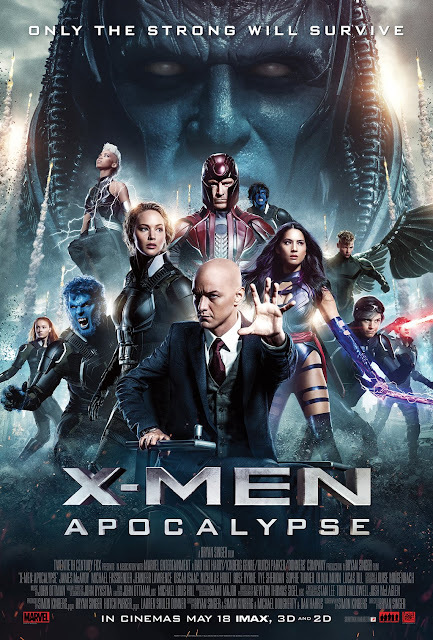 Taglines such as "Prepare for the Apocalypse" and "Only the strong will survive" are the warnings that make up X-Men: Apocalypse. This superhero film based on the characters created by Stan Lee and Jack Kirby and published by Marvel Comics. It is the ninth installment in the X-Men film series. Directed by Bryan Singer; written by Simon Kinberg; based on a story conceived by Singer, Kinberg, Michael Dougherty and Dan Harris. Since the dawn of civilization, he was worshiped as a god. Apocalypse, the first and most powerful mutant, amassed the powers of many other mutants, becoming immortal and invincible. Upon awakening after thousands of years, he is disillusioned with the world as he finds it and recruits a team of powerful mutants to cleanse mankind and create a new world order, over which he will reign. As the fate of the Earth hangs in the balance, Raven and Professor X must lead a team of young X-Men to stop their greatest nemesis and save mankind from complete destruction. The film was announced by Singer in December 2013 the he, along with Kinberg, Dougherty, and Harris, were attached to develop the story. Singer has described the film as "A big monster of a movie." According to Kinberg, this will contain more mass destruction than any of the previous X-Men films. "... The kind of scope and scale we're talking about is like a disaster movie featuring an extinction-level event. We're talking Michael Bay/Roland Emmerich-style moviemaking, which you've never seen in an X-Men movie..." Singer chose Apocalypse as the antagonist to examine the origins of mutants on Earth. In addition, Singer has called this film "kind of a conclusion of six X-Men films...". Casting began in October 2014. By April 2015, along with the previous cast, newcomers Oscar Isaac, Alexandra Shipp, Sophie Turner, Tye Sheridan, Kodi Smit-McPhee, Ben Hardy, Lana Condor and Olivia Munn joined. Principal photography commenced in April 2015 in Montreal, Canada, and wrapped in August of the same year. The film features an ensemble cast starring James McAvoy, Michael Fassbender, Jennifer Lawrence, Oscar Isaac, Nicholas Hoult, Rose Byrne, Tye Sheridan, Sophie Turner, Olivia Munn, Lucas Till, Evan Peters, Kodi Smit-McPhee, Alexandra Shipp, Ben Hardy, Lana Condor and Josh Helman. The performances, this time round, were varied. McAvoy, Fassbender, Lawrence, Hoult, Byrne and Till gave another round of fine performances, despite having static character relationships, being under-utilised and, at times, delivering performances in the most wooden way possible. As for the newcomers, Sheridan, Turner, Peters and Smit-McPhee shined in their roles. Munn, Shipp, Hardy, Condor and Helman unfortunately suffered to the point where they seemed to serve no purpose to the overall story and were given very little to accomplish. Finally, Isaac gave a fine performance as Apocalypse, despite becoming less menacing as the film progressed. With X-Men: Apocalypse, what Singer achieves is a sense of grand scale that makes the film fun to watch as an X-Men film. However, it is a cinematic fireworks show without the worthy grand finale. Ultimately, it is a promising setup killed by disaster-film cliches. The tagline of this Marvel cinematic conflict reads "United we stand. Divided we fall", and that is what is going down in Captain America: Civil War. This superhero film directed by Anthony and Joe Russo; produced by Marvel Studios; adapted by Christopher Markus & Stephen McFeely; based on the comic book mini-series Civil War by Mark Millar. It is the sequel to 2014's Captain America: The Winter Soldier, and the thirteenth film of the Marvel Cinematic Universe (MCU). One year after the events of Avengers: Age of Ultron, many people are fearing the actions of super heroes, the government decides to push for the Anti-Hero Registration Act, a law that limits a heroes actions. This results in a division in The Avengers. Iron Man stands with this Act, claiming that their actions must be kept in check otherwise cities will continue to be destroyed, but Captain America feels that saving the world is daring enough and that they cannot rely on the government to protect the world. This escalates into an all-out war between Team Iron Man (Iron Man, Black Panther, Vision, Black Widow, War Machine, and Spiderman) and Team Captain America (Captain America, Bucky Barnes, Falcon, Sharon Carter, Scarlett Witch, Hawkeye, and Ant Man) while a new villain emerges. 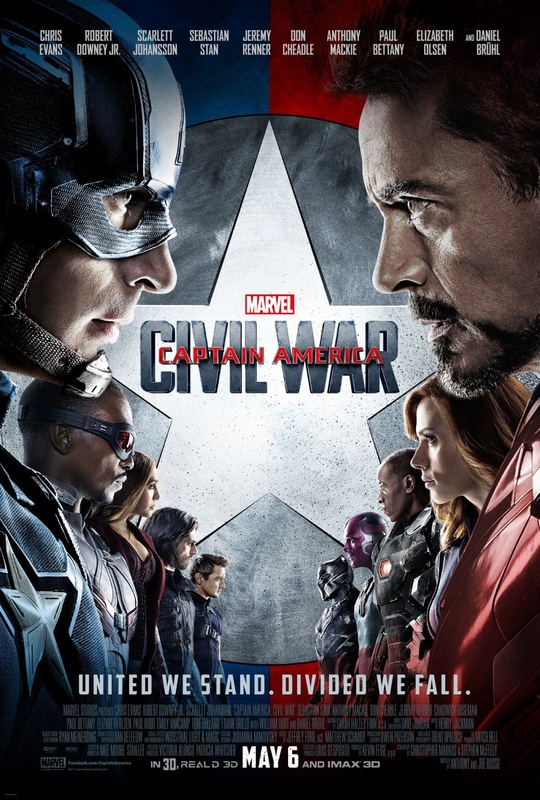 Development for Civil War started in late 2013 when Markus and McFeely began writing the screenplay, which borrows concepts from the 2006 comic book storyline. The Russo brothers were brought back to direct in early 2014 after positive reactions to test screenings of The Winter Soldier. The film's title was revealed in October 2014. As well as Marvel veterans, including Chris Evans, Robert Downey Jr., Scarlett Johansson, Sebastian Stan, Anthony Mackie, Don Cheadle, Jeremy Renner, Paul Bettany, Elizabeth Olsen, Paul Rudd, Emily VanCamp, Frank Grillo and William Hurt, were added to the cast. In addition, new cast members, including Chadwick Boseman as Black Panther, Tom Holland as Spider-Man, Daniel Brühl as Baron Zemo and Martin Freeman as Everett Ross, joined the film in the following months. Principal photography began in April 2015, before concluding in August 2015. Locations included Atlanta, Georgia, Puerto Rico and Germany. 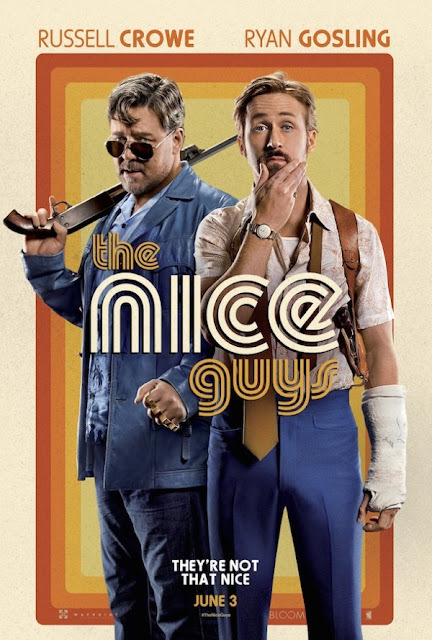 The movie features an ensemble cast that includes Evans, Downey Jr., Johansson, Stan, Mackie, Cheadle, Renner, Bettany, Olsen, Rudd, VanCamp, Grillo, Hurt, Boseman, Holland, Brühl and Freeman. The cast gave spectacular performances, with the veterans giving another awesome round, and the new additions shining brightly among the veterans. Boseman as Black Panther and Holland as Spider-Man stole the show whenever they leapt on the screen. Evans and Downey gave powerful performances when at conflict at one another, making Batman and Superman's conflict look like a school playground brawl. With the help of its impressively huge ensemble, some amazing action sequences, and even a few surprises, Captain America: Civil War is an entertaining adventure and a strong addition to the Marvel canon. However, there's something about the film that is not on par with Winter Soldier. It smothers a potentially powerful story with an overstuffed cast list, and confusing and cliched subplots. Also, see my reviews for Captain America: The Winter Soldier and Ant-Man.